Sparkle into a Retro Gaming Christmas in Leicester this Sunday! 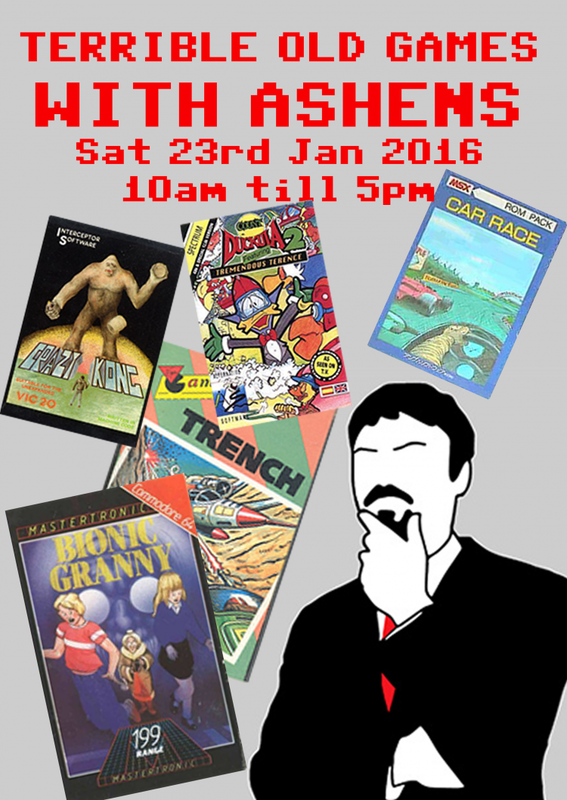 Leicester’s ever-popular Retro Computer Museum is having it’s own Christmas event at their HQ in Thurmaston this Sunday 6th December 2015, starting at 11am and going on until 10.00pm (ish). And as well as retro gaming galore, there will also be LIVE music courtesy of the museum’s good friend EQUINOXE! Tea/Coffee will be available – but you are most welcome to bring your own festive drinks too! A food van will be available for most of the day, selling a wide selection of items at great prices. Entrance to this event will cost £10 (But please do donate more if you wish) This is payable via the Museum’s Virgin Charity Giving page (Registered Charity No. 1146912). Please note that there are a limited number of 50 tickets available for pre-sale only! No tickets will be available to purchase on the day. The Museum is located at: Unit S1, Troon Way Business Centre, Humberstone Lane, Leicester LE4 9HA. Computer image and festive banner courtesy of the Retro Computer Museum. Definitely getting into the festive mood now, The National Museum of Computing (TNMOC) at Bletchley Park, near Milton Keynes, is all set for some seasonal fun later in December! And the sparkling line-up for their Christmas Bytes Festival includes robots, virtual reality, wearable tech, animation workshops, Arduino workshops, SoundBytes, code-breaking and more – all running between Running 19th-23rd and 27th-30th December this year. See NAO robots in action! convert your smartphone into a cut-down Oculus Rift! Use LEGO and animation software to enable you to create your own short animations. The great news is, all this is covered by the normal TNMOC Entrance Fees! For more information, check out The National Museum of Computing’s website, including their Visiting page. 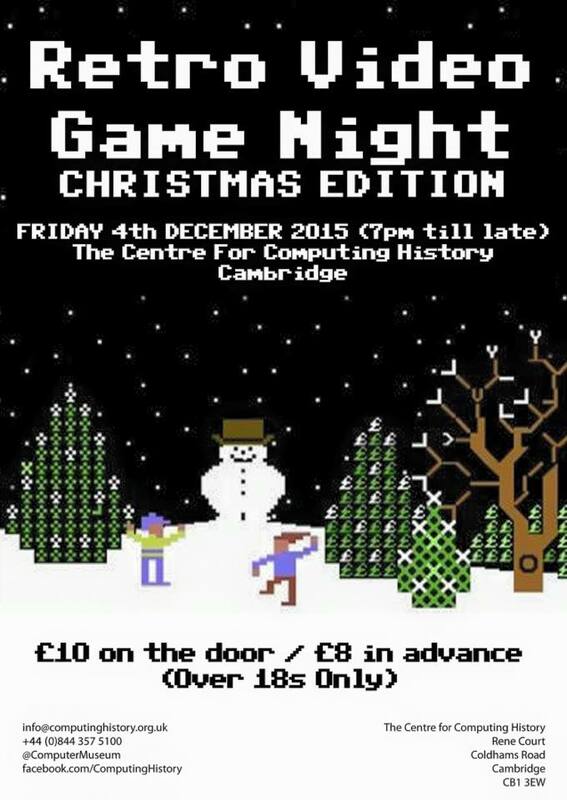 Have a Merry Retro Christmas in Cambridge! If you’re looking for something more fun than repeats on telly, soggy sprouts and stale turkey this Christmas, why not plan a seasonal visit to the Centre for Computing History? And what more festive occasion to drop in on the Centre (located in Rene Court, Coldhams Road, Cambridge CB1 3EW) than on their Christmas themed retro video game night, which will be the last one of 2015? This Christmas, they’re opening up specially between 7pm to midnight this Friday 4th December, and they’re going to have some awesome seasonal video games available to play – you’ll even get the chance to win the shirt off the Games Master’s back! All their usual gaming displays will be on and they’ll be getting loads of extra consoles and games out from their archive for you to play. So why not join them for a great night out and help support the work of the Centre? Due to fact that you can bring your own booze and that there’ll probably be a few video game titles not suitable for kids this is an over 18s only event. Spaces for this exciting gaming night are limited, so booking at the advance rates of £8 per person is required to ensure your place, although if you’re lucky you *may* get in on the night – but please note that tickets on the door will cost £2 extra). And for more information on visiting the Centre, see: Visiting the Centre for Computing History. PLEASE REMEMBER: Due to the fact that this is BYOB and the adult nature of some games this is an over 18s event. Welcome to Retro Computing News, the online magazine covering retro computing, history of computing, retro/indie retro gaming, Raspberry Pi and allied subjects. 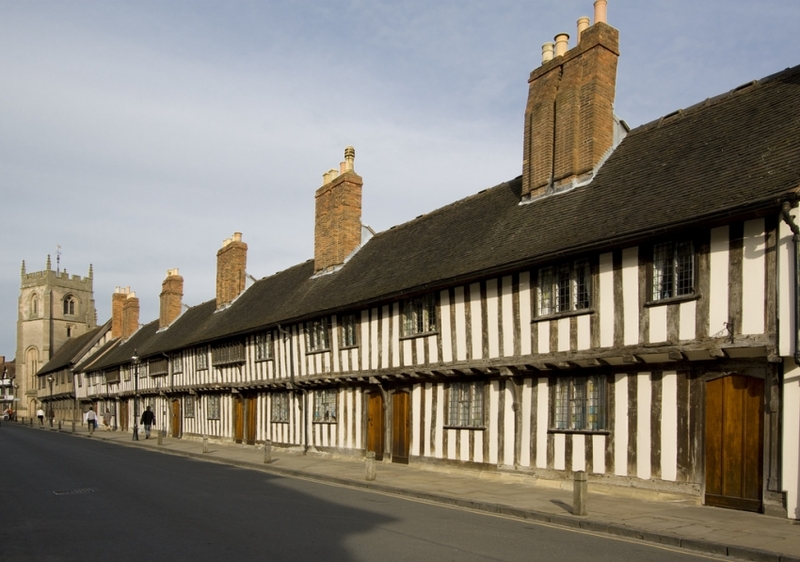 We're always keen to include news about and cover events, happenings and exhibitions, places of interest such as museums, anniversaries and personalities, particularly, though not exclusively, with a UK focus. Also relevant technology, hardware, software, media or literature including science fiction, science and robotics. In fact, anything of potential interest to our readers. You'll find news, features and topical posts on this page and via the links in the left-hand column, also selected news and features are highlighted with pictures at the top of the front page and in asides under BITS & BYTES in the left-hand column. We're also looking to preview and review relevant retro-themed computing and gaming hardware and books, so if you're a manufacturer, publisher or author looking to raise the profile of your work, do get in touch! Our first hardware review will be published this weekend. We're interactive! Don't forget our social media outlets, where we also relay a whole load of additional info, especially international, some of which might not reach these pages! Enter your email address to follow Retro Computing News and receive notifications of new posts by email. Follow us on Twitter – our re-tweets are relayed here! A project to produce books detailing the history of Mastertronic budget computer games has gone live on Kickstarter. Founded in 1983 by Martin Alper, Frank Herman and Alan Sharam, British company Mastertronic went on to become one of the UK’s biggest home video game publishers of the 1980s. The company’s marketing strategy of putting games on shelves at the low price of just £1.99, when most other games sold from £4.99, resulted in booming sales and massive profits for the London-based company. The Kickstarter appeal aims to produce both a standard volume and an enhanced collector’s volume detailing the history of these games. The project is being organised by publishers Player One Books of Canberra, Australia. The books are unofficial publications. First up is the Standard Edition 256 page hardcover book covering all of the Mastertronic £1.99 releases including game reviews, game credits, screen shots, cover images and more. The special 512 page Collector’s Edition includes everything in the Standard Edition, PLUS an additional 256 pages featuring game reviews, game credits, screen shots, cover images and more of the other Mastertronic labels such as M.A.D., Americana, Rebound, Rack-It, etc PLUS the unique disk releases. The “199 Range” Limited Collector’s Edition pledge includes the “199 Range” 512 page Collector’s Edition featuring a unique cover design, PLUS a signed and numbered “199 Range” bookplate, PLUS a 128 page Cover Art Gallery book featuring a range of game covers including commentary by select original cover artists, PLUS a limited edition “199 Range” USB cassette, featuring a custom “199 Range” inspired hand numbered inlay, and containing a 512 page PDF copy of the The Mastertronic Archives Collector’s Edition, and a 128 page PDF copy of the cover gallery book PLUS a set of limited edition postcards. Funding options are shown in Australian dollars on the Kickstarter site, not to be confused with US dollars. UK and EU backers: Books will be shipped from within the UK to minimise shipping costs and delivery times. North America backers: Books will be shipped from within North America to minimise shipping costs and delivery times. Australian backers: Books will be shipped from within Australia to minimise shipping costs and delivery times. 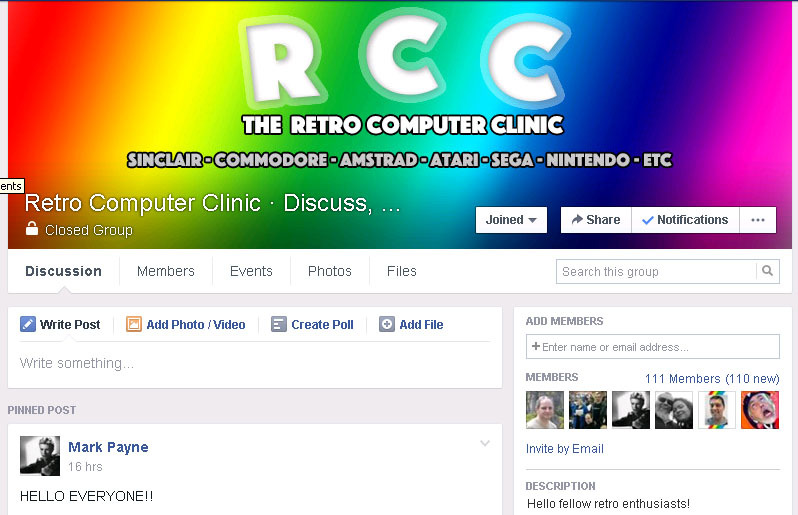 A new Facebook group for retro computing enthusiasts has been launched. The group, which will be of particular interest to anyone looking for new hardware add-ons, repair service and general advice, has been dubbed the ‘Retro Computer Clinic’ and is aimed at users of classic Sinclair, Commodore, Amstrad, Atari , Sega, Nintendo and similar retro computing systems and consoles. The buying and selling of retro goodies and services will be permitted from day one, and the wide discussion of topics including DIY repairs, restoration, expansions and retro computing/console gear in general is encouraged. Admins Mark Payne and Ash Evans are in the process of inviting as many experts (both professional and amateur), enthusiasts and hobbyists as they can to get the new virtual meeting place humming – and all are welcome. The Centre for Computing History has posted a new video on YouTube from the Cambridge, England museum’s Heritage Lottery funded Viva Computer project. In the video, Andrew Oliver (seen below) talks about the early days when he and his brother became legendary UK games programmers and pioneers in the 1980s. They became known to their legion of fans simply as The Oliver Twins, and decades later are still active today in the industry and the retro community. At around the age of 12 the twins began their careers writing games for the UK games market, including the highly regarded Dizzy franchise, which is still popular with retro computing fans today. In 1990 they founded Blitz Games Studios which at its height employed 235 people. In 2013 they set up a new studio called Radiant Worlds along with their long term friend Richard Smithies, focusing on games as a service. 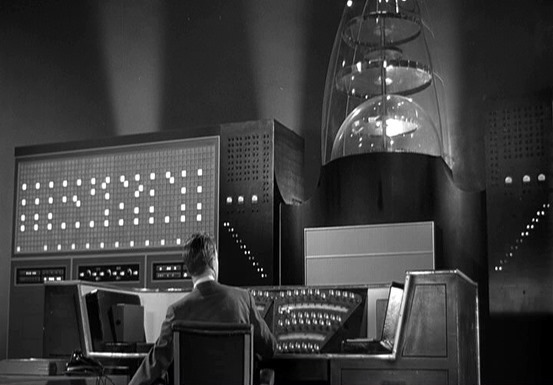 Images courtesy the Centre for Computing History. 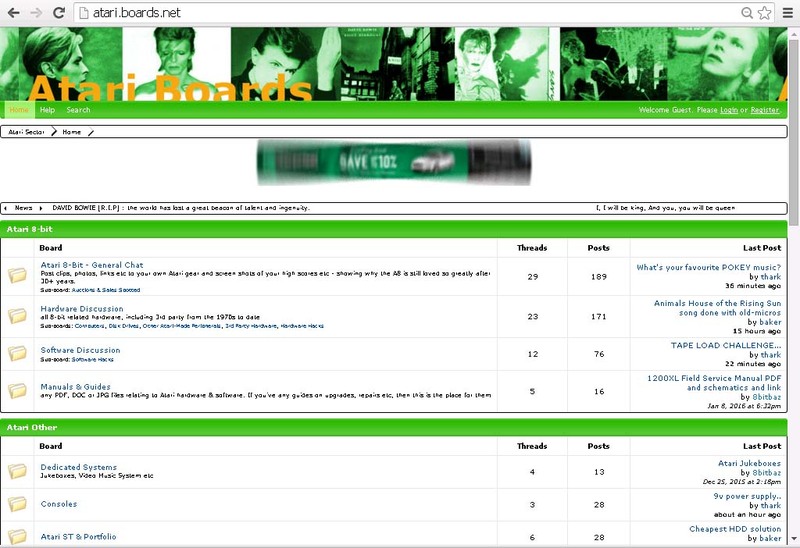 A new forum for fans of classic Atari home computers and consoles has opened online – Atari Boards. The discussion group’s primary focus is retro Atari 8-bit, but 16-bit and games consoles can all be discussed, with forums covering all of these plus relevant hardware, software, manuals and guides. There is also scope for wider computing and gaming topics, including custom builds, arcade, Mame and jukebox/video dedicated systems – and more general topics. One of the early 21st century’s smallest computers has been turned into a 1970s minicomputer and shown off at a museum in Galway, Ireland. Pat Moran, of the Board of the Computer and Communications Museum of Ireland – CCMI, has demonstrated, at a museum public exhibit, a PDP-8 simulator based on the credit-card sized ARM-based Raspberry Pi, the English-designed and Welsh-made spiritual descendant of the BBC Micro. Pat previously worked in the Digital Equipment Corporation (DEC) plant in Galway city where these refrigerator-sized 12-bit minicomputers were manufactured until production ceased in 1979. The simulator uses a miniaturised version of the famous flashing lights and switches on the front of these much larger, yet less powerful, computers, which put a smile on many of the former DEC employees and users of PDPs that attended the show. For more information on the Museum, which is located at the Insight Centre For Data Analytics, IDA Business Park, Lower Dangan, Galway, Ireland, check out their website or their Facebook page. Fun with terrible old games in Cambridge! Like movies, some video games are so bad that they’ve become cult classics, or at least a legend in their own lunchtime. For every great game there are always several awful games that balance things out in the gaming Universe. So come along and re-live the agony of playing some of those terrible old games that you threw in the bin or returned to WH Smiths as a kid. Stuart will be hanging out at the museum for most of the day if you’d like to meet him or to get anything signed. Tea, coffee and snacks will be available from the Pac Lunch Shop. Normal museum entry fees apply. Booking is not essential, but if demand is high priority will be given to those who have booked in advance. Come join us on Twitter! Did you know that Retro Computing News has over 1000 followers? Why not join us over there, where we also retweet items of interest from other feeds? Filming is under way for a new documentary, Memoirs of a Spectrum Addict, a full length feature film (120-180 minutes, est.) which is aiming to take a detailed look at the Sinclair ZX Spectrum, its history, its developers, its games and its fans. Andy told Retro Computing News that he currently has such industry notables as Jon Ritman, Steve Wetherill, Jas Austin, Oliver Frey, Roger Kean, Simon Butler, Ben Daglish, Mev Dinc and John Romero signed up for the project, with the list growing daily! A great little show for computer fans with retro, hobby and education computing interests is ready to RUN this Saturday in Stratford-upon-Avon, England – at Shakespeare’s school! 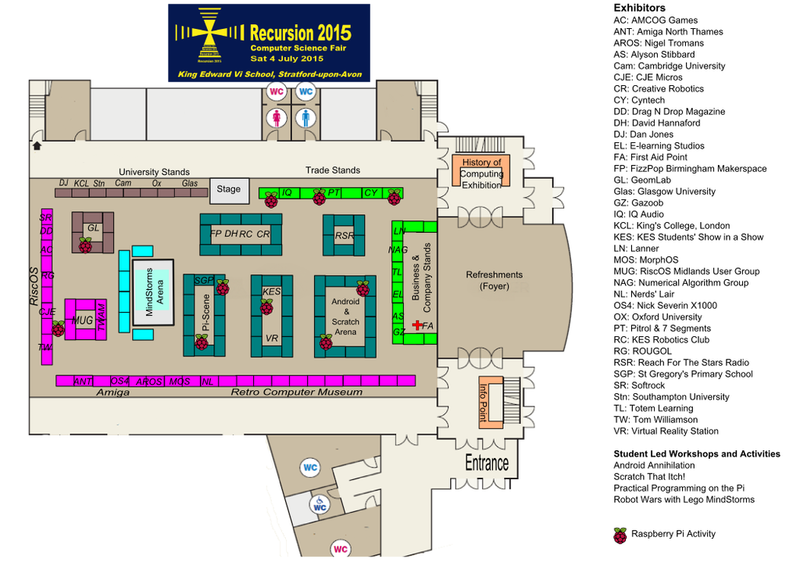 The Recursion 2015 computer science fair is taking place in The Levi Fox Hall at the King Edward Vi School in Church Street on 4 July, 11am – 4pm, and judging by the final exhibition plan released today (click image below for larger version) should be a cracking event – and what’s more, admission is FREE! In fact, we like the look of it so much that our editor, Stuart Williams, will be covering Recursion 2015 in person for Retro Computing News! For more information on the exhibitors and what’s happening at the event, read our recent preview of Recursion 2015 and check out the event website. Download the event programme in pdf form via this link. Amiga, Acorn, RiscOS, Retro computing and Raspberry Pi fans in particular have much to look forward to, whether you’re into hardware, software or coding – as does anyone interesting in computing education and employment, making stuff – and robotics! There’ll be exhibitors from universities to user groups, via museums and business – as well as student-led workshops. Something, in fact, for geeks of all ages. IF you can get there, THEN GOTO it – it looks like a great computing day out – with added Shakespeare! Visit Recursion 2015 this Saturday! It’s National Volunteers’ Week, and the award-winning Museum of Computing in Theatre Square, Swindon, England has appealed to people who can give up some time to help out. It is open on Fridays from 10am until 4pm and on Saturdays from 9.30am until 5pm. The museum traces the history of the computer from ingenious mechanical devices to compact machines from as recently as a few years ago. Countless machines are on display and many can be used by visitors. The same goes for its extensive stock of gaming machines, the earliest of which include ‘Pong’-style offerings, which thrilled a generation when they were released in the early 1970s. The museum also runs computer clubs for people of all ages and organises regular events such as live action Pacman tournaments. In a news item published this week by the Swindon Advertiser newspaper, museum spokesman Rob Leaney said roles included welcoming people at reception and helping catalogue the vast collection of computing items. “We’re always on the look-out for anyone who can help us with everything from helping out with events, manning the front desk and cataloguing the collection, to a spot of cleaning,” he said. The museum especially needs people who can help organise events, work at the front desk on Fridays or be assistant volunteer co-ordinators. For more details and to apply via email nora@museumofcomputing.org.uk or call 07834 375628. Computer-mad volunteers needed in Swindon! Unless otherwise indicated the contents of this site are copyright and may not be used without permission.